Feeling stuck? Is your life not playing out the way you would like? Don’t despair. You have the ability to radically shift your reality by engaging in a few simple daily practices. Your life canwork magically. Things can flow easily and effortlessly. You can create abundance, harmony, wellness, vitality, and joy in all areas of your life. It just requires a little dedication and conscious intention. Many people believe that a new habit takes 21 days to take effect. Why not give it a try by incorporating these 5 daily practices into your life over the next three weeks? See what happens. Watch your life transform right before your eyes. Have you noticed that physical manifestation is happening faster and faster lately? Do you remember when it used to take eons for a thought or idea to move from energy into physical form? Something has definitely shifted and now whatever we choose to focus on, good or bad, is manifesting into reality much more quickly. Personally, I have noticed that whatever scenarios I find myself thinking about during the day have been coming true in real life. At first, I was depressed thinking that things just weren’t flowing for me. I checked the astrological calendar. Was something in retrograde? Were there solar flares? Then it hit me like a Mack truck. Wait a second, I thought, these negative scenarios were the exact same ones playing in my head while I was getting ready this morning. They were the same situations frustrating me as I drove to yoga. Why have I been focusing on what I fear instead of creating what I want? Sure, this is the Law of Attraction 101 but sometimes we all slip into bad habits, don’t we? I decided to make a change right then and there. I took 10 minutes and visualized exactly how I would like my day to play out. I imagined every detail of my day from the smiling faces of the people I would encounter to the way I would feel when traffic flowed easily on my morning commute. I saw myself receiving phone calls with good news. I envisioned a positive outcome on work-related negotiations. I watched my problems disappear almost miraculously. I imagined my creativity flowing easily as I sat down to write. I visualized every detail of my day and experienced the feeling of ease and joy I would experience as it all flowed effortlessly. Guess what? My day played out almost exactly as I had envisioned. I was reminded that we are all powerful creators. Now I spend 10 minutes visualizing my perfect day as I drink my morning coffee. I encounter much fewer surprises throughout the day. Life is once again in alignment. We are all masters of manifesting, in our highest form. Remind yourself that if you are not actively creating your life, you are passively participating in someone else’s reality. If we remember this simple truth, we can change the world one amazing reality at a time. Wake up and start your day with sunshine. Go outside and stand barefoot on the Earth as you watch the sun come up in the morning. If you feel compelled, engage in the ancient practice of sungazing. This means staring directly into the sun just after it rises. Start with just a few seconds. As you gain comfort with the practice, you can increase the amount of time you stare at the sun. Sungazing is practiced during the first hour after sunrise or one hour before sunset, when the sun’s UV rays are minimal. Many believe that the sun is one of our strongest forms of prana. Sungazers report incredible benefits from staring at the sun including increased energy, greater alertness, decreased appetite, mental clarity, and improved connection to source energy. Whether you actively sungaze or simply enjoy a beautiful sunrise, you are allowing your physical body to align with the energy of the Sun. As you bathe yourself in the colors of a sunrise, you are taking time to honor something beyond the Earth plane. It does not matter how long you spend soaking in the magnificent energy of the Sun. Simply having the intention to do so and taking a moment to honor the sunrise, can have enormous benefits in the creation of a positive reality for you. Affirmations retrain your brain. Your brain is a reality-creating computer so you need to make sure it is programmed correctly. If you don’t consciously program it, something else will whether it is TV, social media, your doom-and-gloom neighbor, or your own negative programming. Affirmations allow you the opportunity to rewrite the scripts playing in your head. By doing this, you change the way your life plays out in physical reality. I started this practice over 10 years ago after reading Louise Hay’s book, You Can Heal Your Life. I wrote out my affirmations and read them aloud every morning while getting ready for the day. For the first two or three years, I honestly did not notice much change in my life. I did my best to keep the faith and keep going even though I had no physical proof that anything was happening. And then, suddenly, everything started improving. I got a new job and my income doubled overnight. I moved from a part of the country I didn’t love to an entirely new environment where I felt happy, energized, and peaceful. Things were happening. It worked! I have been saying my affirmations religiously ever since with great results. If you have never written affirmations, don’t worry, it is easy! Start simple—I am healthy. I am happy. I am successful. I am full of love. Remember to always speak in the present tense and stay positive. I have everything I need. I trust the universe. My life flows easily and effortlessly. Write what you want to happen, not what you want to avoid. So instead of saying, I am now out of debt, say, I am prosperous. Release attachment to how things will happen and instead, attach gratitude to the affirmations as if they are already happening in your life now. For example, I am so grateful that I have abundant energy today. Or, I am overjoyed that my relationships are harmonious. Give the universe the freedom to do its work. Everything we desire is really just energy. When we allow the energy behind what we want to come to us, problems often resolve themselves in unexpected ways. Start your day by connecting physically with the Earth. Think of it as filling up your tank or recharging your battery. Whether it means walking barefoot on a sandy beach or doing Qi Gong in the park, take time to ground yourself into the energy of the Earth. Strengthening your connection to Mother Earth is a simple as walking outside and lying down on the grass, sitting on a boulder, walking through a forest, or swimming in the ocean. I like to meditate underneath the trees and listen to the leaves dancing in the wind. As the leaves fall down around me, many insights have come to me. Not only does nature inspire, it also heals. Reconnecting with Earth energy is not just advisable, it may be a necessity given how disconnected modern society is with the Earth. Take a moment to leave your electronic gadgets behind and physically touch the Earth. Take a deep breath. As your hands touch the ground, send love to the Earth. Thank her for all she has done for us, for the life she has given us. Exhale. Now intend to receive healing energy from the Earth. Allow this life force energy to flow through your body in an infinity pattern. Imagine this energy staying with you throughout the day. Visualize yourself plugged into the Earth, like a grounding cord of energy, all day long. Tap back into this energy source throughout the day whenever you need a boost. Water is life. The Earth is over 70% water. Our physical bodies are made up of approximately 70% water. It is no stretch to say that we are water. The more we understand water, the better we know ourselves. Start by drinking clean water. Most water from the tap and even from some bottled sources is contaminated with toxins and chemicals such as fluoride, chlorine, prescription drugs, arsenic, and pesticides. If you don’t have access to pure spring water, then purify your water or drink distilled. Also, don’t drink from plastic containers. Preferably, drink your water from glass. By doing these things you are moving from energetically contaminated water to energetically neutral water. Your next step is to positively charge the water you are drinking. This means changing the energetic structure of the water. Dr. Masaru Emoto’s scientific research shows that water exposed to positive words, thoughts, symbols, images, and music produces a beautiful crystalline structure in its molecules. Water exposed to negative words, thoughts, symbols, images or music produces unattractive and disharmonious crystals. Which type of water do you want to drink? What kinds of water crystals do you want forming inside of your body? Healthy water molecules create a healthy body. Positively charged water can positively influence your entire day. Energizing your water is easy. Fill a glass container with pure, clean water. Place the glass container on top of a beautiful word such a love, harmony, or joy. Better yet, choose a bottle with the word already etched on it. Whatever your intention is for that day, choose an appropriate word. Make sure your water is in a spot where it can receive direct sunlight. Leave the water in the sun for a minimum of 1 hour. Your water has now been infused with the positive energy of the word you selected. As you drink this water, your entire being is filled with this same beautiful crystalline structured energy. 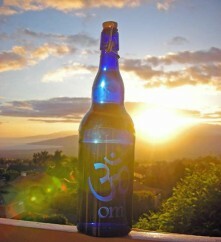 For more on creating your own positively charged water, visit http://www.raineymariehighley.com/harmony-water/. Life is far from perfect. No matter what we do, we are still active participants in a collective reality that is sometimes hard. Maintaining a positive attitude while the world is dragging you down can be difficult. However, by employing a few simple daily practices you can overcome life’s challenges with more ease. By setting the intention to create an improved personal reality, you also contribute to a better collective reality. By empowering yourself, you empower us all.